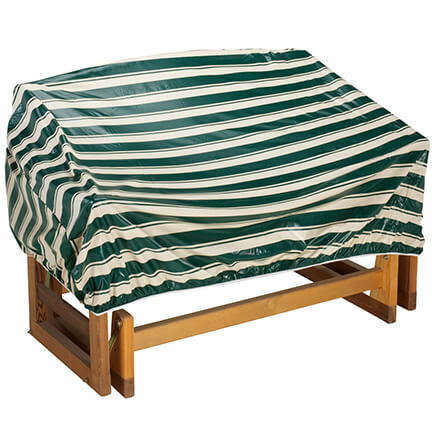 Buy 3, Get 20% Off Select Outdoor Living Items. Discount Applied in Cart. We were using tarps and stakes which was a pain, especially since the tarp would blow off! This cover goes on easily and stays on even in the high winds we have up here! This is a nice cover but I wish it had something on the bottom like a string or better elastic to keep it tighter. Otherwise,,,,, its a great material and perfect size for those smaller ride on lawn mowers. Keeps my mower protected from birds and weather. Just the right size for my garden tractor. The elastic helps keep it in place. We were using regular tarps and staking them in the ground with tent stakes, which was a pain, and in the heavy winds we get up here, the tarp would blow off! This cover goes on easily and stays on! I needed a cover for a 40x60 table..and could not find one..and this fits the bill. This is the 2nd one I bought as the last one lasted forever & like that this one has some elastic around the bottom for a tighter fit. 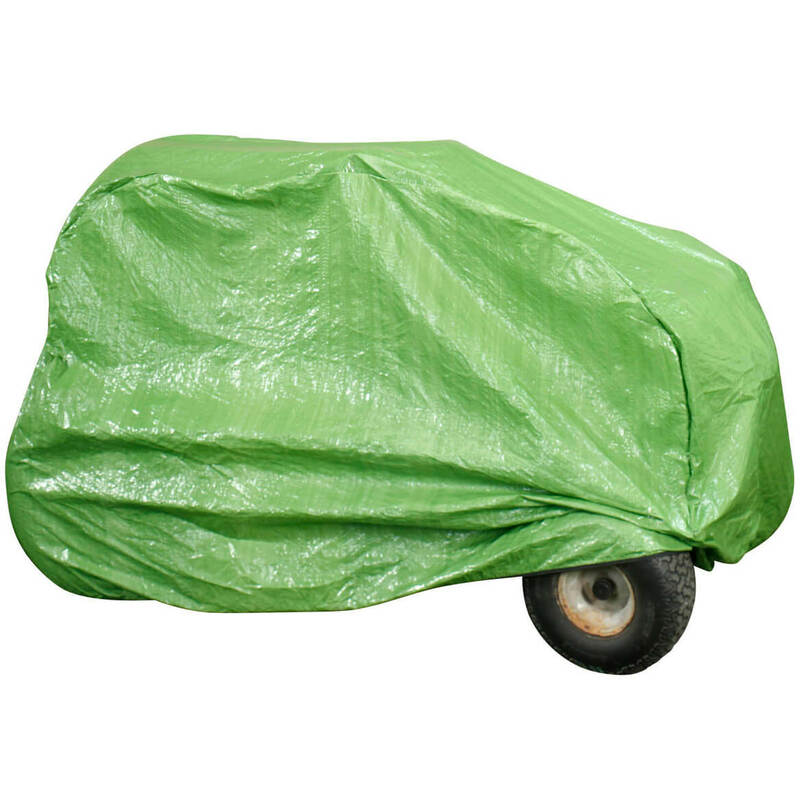 This riding lawn mower cover was exactly what i was looking for. Was tired of storing the mower in the shed and lugging it out every week. Now with this cover i park it beside the shed, uncover when needed, start the engine and start cutting the lawn. Very durable too for the money. Great product for my mowers. Wanted something to cove r the mower against the weather. My husband was very proud of it. It fit his mower very well. This product is very good for the price. It's a little flimsy, but if your careful, it will last. 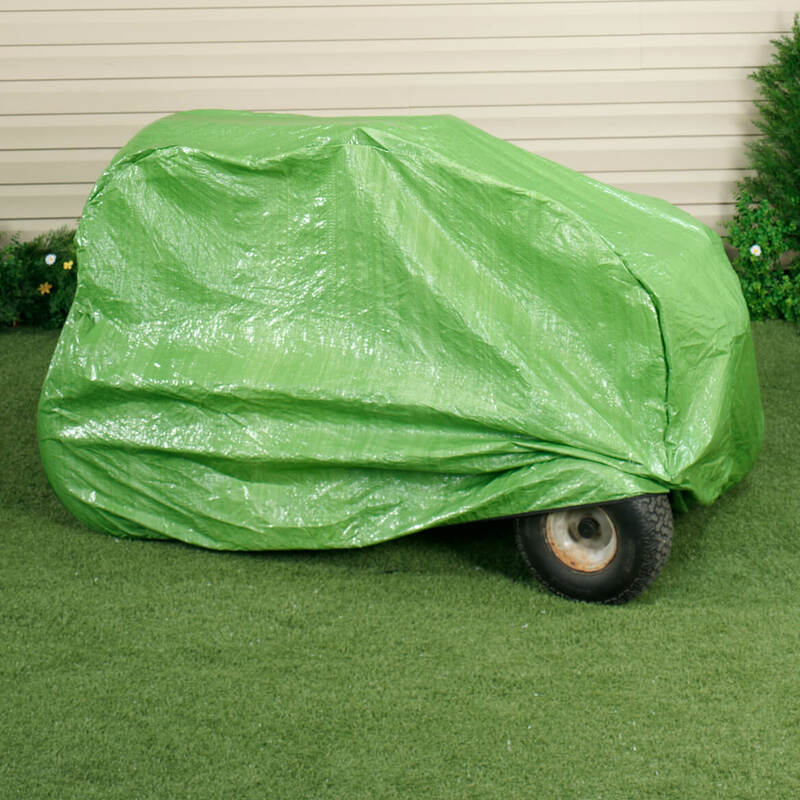 This cover completely covers my riding lawn mower, down to including the tires. However, it did seem to let rain through , on the seat, which is the main reason that I wanted a cover. Hate having to dry the seat whenever I want to use it. Can't find a hole in it, must have a thin spot. Only have gotten to use it this once, so turned it around to see if it still leaks. So far it works but we had to hook these straps on to something under to keep it on. The elastic on the bottom makes it a pain to put on. You have to keep looking under it to find the edges so you can pull it out. Then you have to walk around it to keep doing this until you finally get it over the mower. This ripped in the first storm that came through! Is an item I have been searching for and I need. I did choose it because we needed one and also it was showing on sale for 14.99, but did not come up that price when I ordered it. We purchased one about 10 years ago and it has been very good. The heat and weather just finally caused it to split. It has served us well. 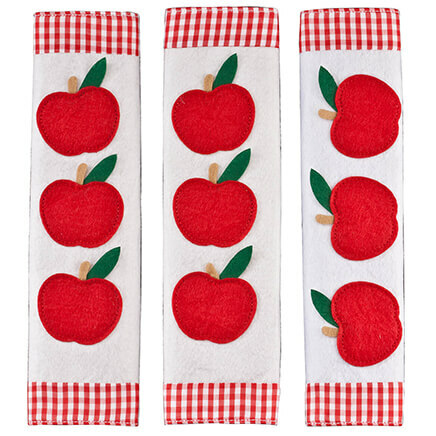 These covers will work just great for my Great Grand Daughters quads. I will use this as a cover for my central air conditioner. looks easier than fitting a tarp to it. Looks like a good size to cover a game table. Got this so my husband can quit taking my round fitted table cloths for his mower. He's gonna love it. ideal for what I need at reasonable price. 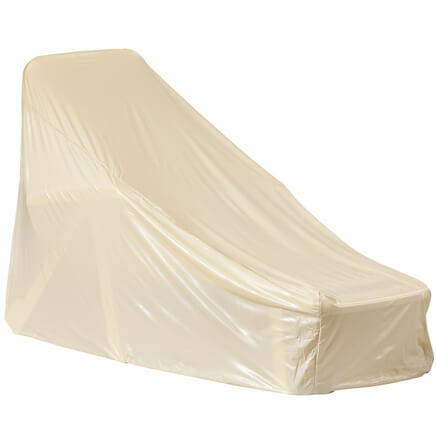 Need something to cover riding lawn mower, cover we had cost $70.00, decided to try this one. Protect my lawn mower during the winter months. I in need of one. Ordered one in 2016 and it did the job well for two years, then it began to rip and rot and I needed to replace it. Wish it lasted longer but you can't have everything. I think it is probably a good value for the money. It is a re-order. Lost the first one during high winds. It fit good, but needs strapped down. There is no room in our garage for our lawn mower so this works well under our deck - waterproof! to put on my mower. having no shelter for this equipment these covers will come in handy. Works well for summer rains. Not strong enough for extended use. I need a cover for my granddaughter toy car that I keep in my back patio. This size is perfect. store ride on mower outside in winter.. will give protection from weather. Price and not shipping charge! To cover my snowblowers, because they are left outside. Need something to protect my mower from the rains. Hope it does the trick. Will it fit a John Deer regular size, with mower deck attached? BEST ANSWER: It should I put it on a smaller one and had lots of extra left over. will this cover fit my craftsman 42" mower? BEST ANSWER: Thank you for your question. 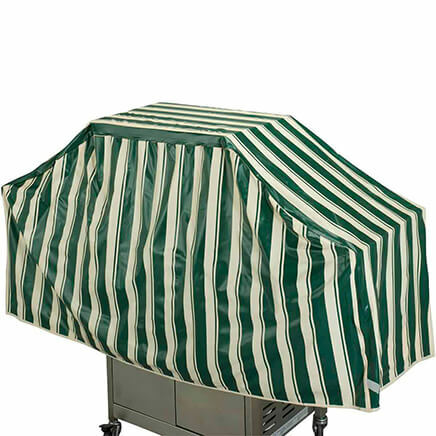 The riding lawn mower cover will lawn mowers up to 65" long by 40" wide by 44" high. We hope this information will be of help to you. 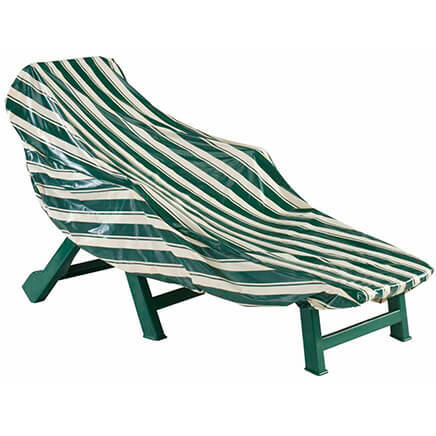 thank you for helping me appreciate it.. ina costlow now, i pray i can get measurments right...thanks again..
Deluxe Chaise Lounge Cover 68"x30"x27"